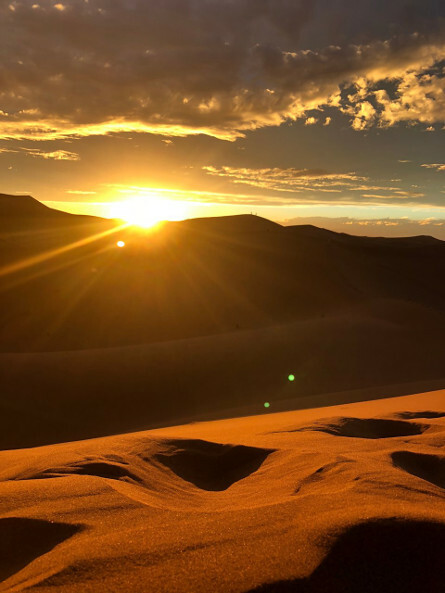 Merzouga is a small village in southeastern Morocco, about 35 kilometers southeast of Rissani, about 55 kilometers from Erfoud and about 561.7 kilometers from Marrakech. 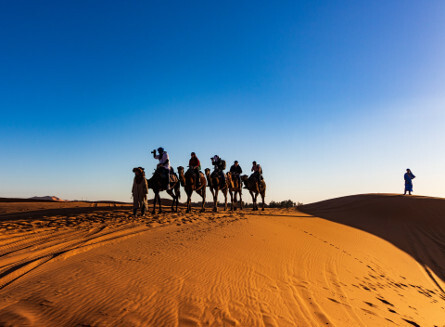 The village is in the Sahara Desert in Morocco on the edge of Erg Chebbi Desert Dunes a 50 kilometers long and 5 kilometers wide set of sand dunes that reach up to 350 meters high. Merzouga has the largest natural underground body of water in the country. 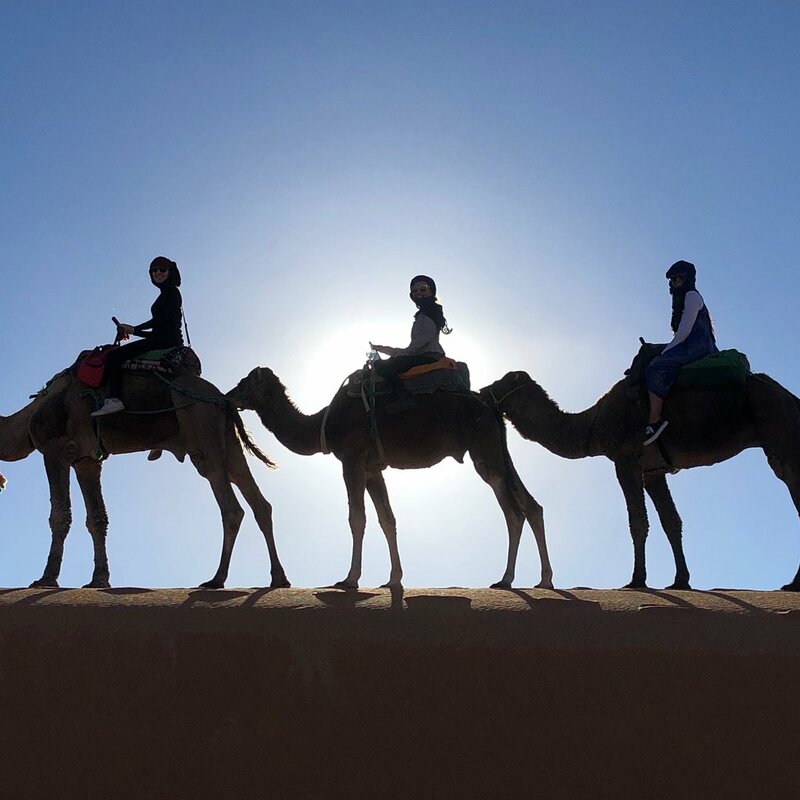 The people of Merzouga are Berber, they are friendly and welcoming. They are loyal to the nomad life its traditions and lifestyle. Winter months (November to February) are cool but sunny, with daily high temperatures only slightly over 10 C, and cold nights. Spring until April is pleasant, with temperatures from 25 C up to 30 C in the afternoons, and with cool nights. Summer months are hot. In winter and spring there is occasional short rain or drizzle (a couple of days per month, on average), but heavy rain is unusual. 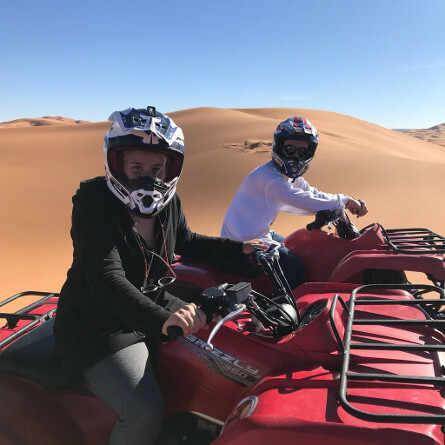 Enjoy your trip from anywhere in Morocco to Merzouga (or Erg Chebbi desert dunes) via our Private Transportation on comfortable, air conditioned and brand new SUVs driven by the best drivers who know the region very well and drive through the dunes with ease. Contact us in order to get an estimate. From Marrakech, drive over the Atlas mountains to Ourzazate, with overnight stops in at least two of Ouarzazate or Ait Benhaddou, Boumalne du Dades, and Tinerhir. After Tinerhir head either to Erfoud and then Rissani, or for a less used alternative route, head south to Alnif and then Rissani. Most of the roads are quite scenic, with the Alnif-Rissani section scenic desert without villages. From Fez, drive South to Erfoud (1 day) and then Rissani. Once in Rissani, drive through the town and follow the road Southeast for 40km (24 miles) to Merzouga. In recent years, the road to Merzouga has been asphalted as well as the road to Taouz, a southern military border town (foreigners cannot cross here). The short access roads (1 or 2 kilometers long) from the main road to the hotels alongside the sand dunes are normally not asphalted, but well maintained. There is now an asphalt road to Hassi Labied, a smaller village about 4 kilometers before Merzouga. Just before Hassi Labied on the main road, there is a gas station providing gasoline and unleaded fuel. Supratours and CTM run direct buses from Marrakech to Merzouga, stopping in all the cities in the way. They have comfortable vehicles and some of them are even provided with WIFI. 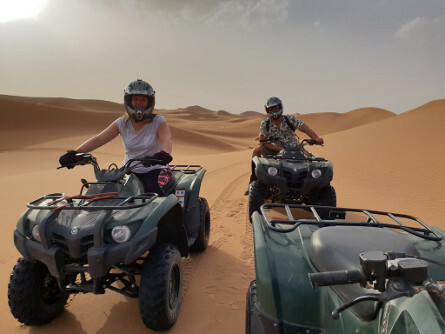 Life in Merzouga revolves around the nearby desert where you can experience and indulge the thrill of the adventure in the vast desert of Erg Chebbi. 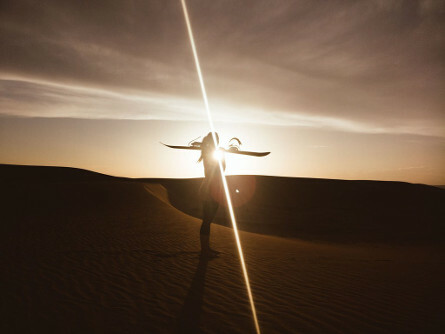 Just you, the golden sand of the African Desert and the beautiful sky. Everybody needs some off-time to vent the modern and busy life we live. Camping in the desert is something you should do at least once in your life and you only live once. It combines the quietude, beauty, magic, fun and spiritual ecstasy. To all that we add luxury. 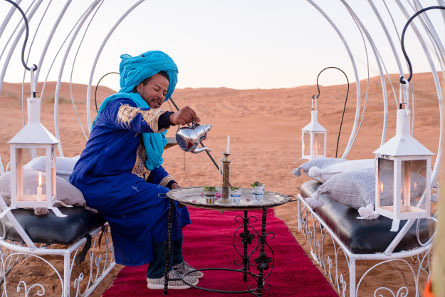 Our private camps in Erg Chebbi dunes are glamorous. Spend nights in private tents equipped with a magical combination between traditional and modern amenities: comfortable beds, copper tables, wooden chairs and modern bathrooms with flush toilets and sophisticated shower to only name a few. Enjoy a moment of pureness around the campfire while listening to live nomad music under the dark sky and the shinny moon and stars. 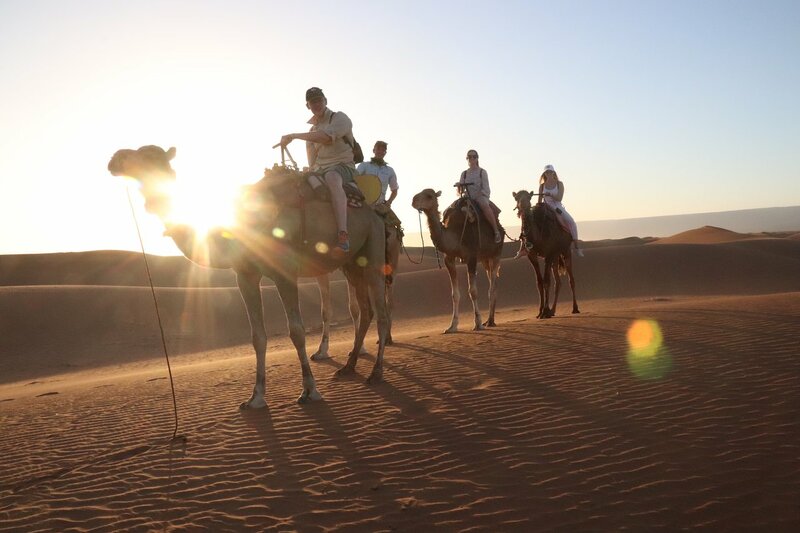 Camel trekking and/or Camel Safari in the desert dunes is a must-do activity. They say that driving on open roads clears your mind. Well, ridding camels in the middle of nowhere clears your soul and helps you vent the modern life stress. If you’re more into adrenalin activities, speed and adventure, you should definitely go for Quad Biking rounds which takes off-road fun to a whole new level. Who said that dunes cannot be ridden? Well, they can be! Sand Boarding (a.k.a Sand Skiing) is another must-do off-road activity with the thrill of speed over the hot dunes of the saraha. Enjoy the beauty of the shinny stars of the dark saraha sky and let your soul and mind transcend to other dimensions and other worlds. Witness sunset and sunrise like you've never saw them before from the top of the dunes. 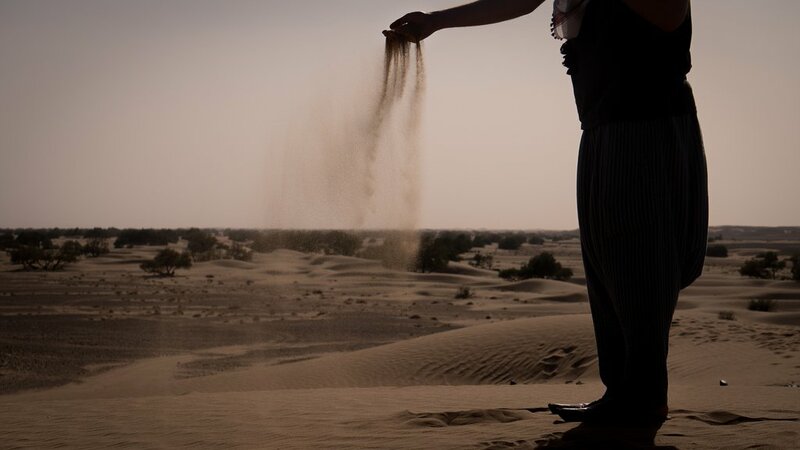 Relax under the hot sun of the Moroccan desert while reading your favorite book or clearing your thoughts. Get to know Berber families by having lunch or tea with one. Get to know how they live, how they spend their day, their humble dreams and simple life. 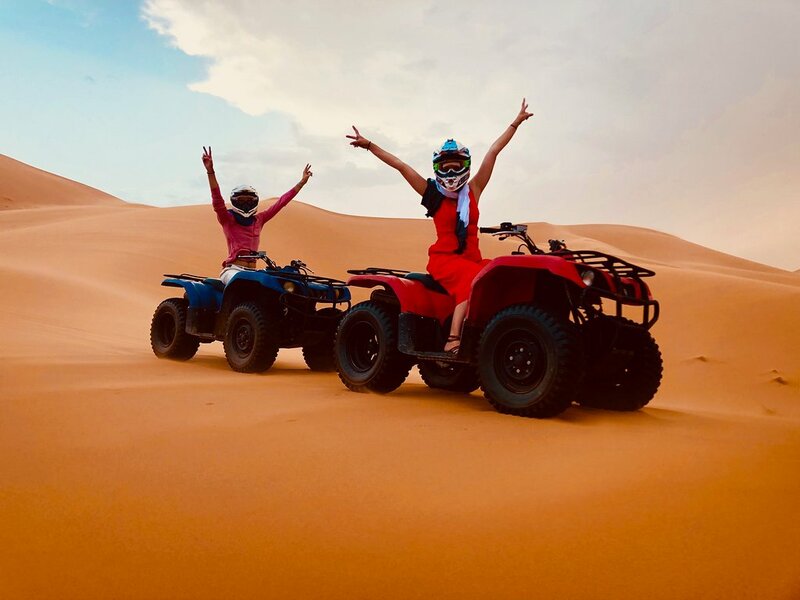 Go picnicking in the middle of the dunes, spend some fun time with our guides, have adventurous rides with our comfortable SUVs in the middle of Erg Chebbi desert. 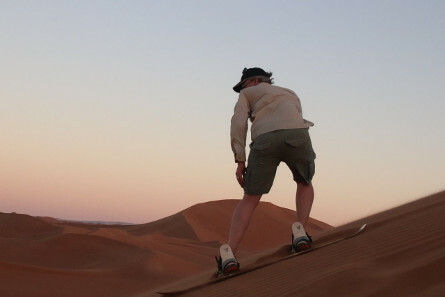 Walking in the desert at dusk is another relaxation activity you will love and enjoy doing in the Erg Chebbi.